We knew their names, now we know how scary they are. Another update, another leak. Or several leaks. Some Fortnite: Battle Royale dataminers found pictures of in-game cosmetic items in the game files after today’s 6.02 update. These are all Halloween-themed, as first predicted by dataminers like @The1Jaren and @MystxcLeaks. They found the names of some of these items in files of the previous update, but at that point they were not able to find any pictures. Finally, they did. The moderator at the r/FortniteLeaks subreddit published them all with their in-game description. 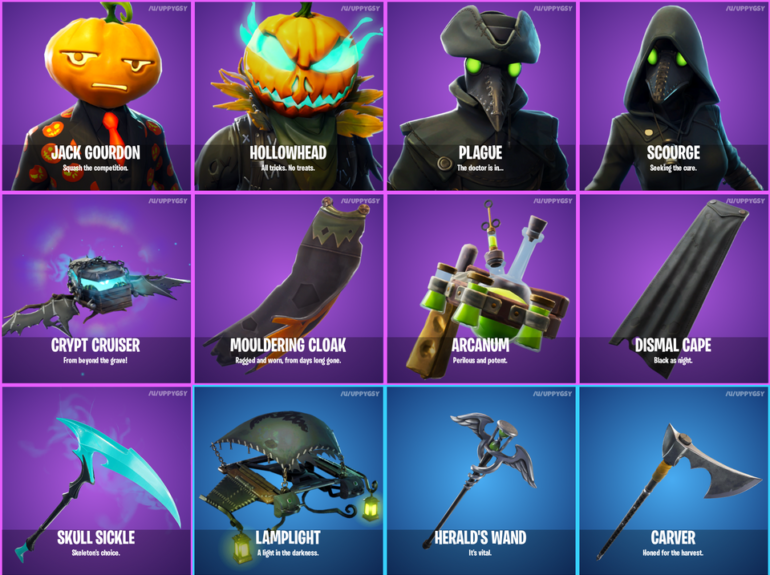 r/FortniteLeaks – v6.02 – Cosmetics! There are six new skins, and five of them share the spooky cartoon look that previous skins with the theme have, like the Skull Trooper. A female version of the skin is also coming, called the Skull Ranger, along with the return of the male skin to the item shop today. Two pumpkin-head skins, Jack Gourdon and Hollowhead, are coming to add more skin options for those who are tired of Tomatohead as the only vegetable character. Two skins are themed after medieval plague doctors and wear a mask with a metal beak-shaped nose. It looks like the Plague skin is a male version while Scourge is the female version. Another of the new skins is called Bullseye, which looks just like the other rare and human skins in the game. She wears a hat with goggles and a shirt with a shooting target stamp. Three new back blings fit the Halloween theme perfectly. There are two capes that can match any of the new spooky skins and a wooden support filled with green potions that should match the Plague Doctor skins. The dataminers also found two pickaxes, Herald’s Wand and Carver. A glider called Lamplight wraps up the group of cosmetics that will make players ready for some Halloween-themed matches. The Crypt Cruiser and the Skull Sickle have also appeared in the datamine. They might be a good clue that this whole list will be in the Item Shop soon, possibly even this week, since they are available today for players to buy with V-Bucks.